It is a truly special teacher who, without the slightest provocation, motivates his students to buy him a house then purchase the adjacent block so that developers won’t block out his sunlight. Such was the gratitude bestowed on Hyaakken Uehida by his former pupils when his own home was bombed by Allied forces in 1943. The Professor of German Literature had recently decided to quit teaching altogether and concentrate on writing when his house was destroyed. After squatting an abandoned garden shed for a year with his devoted wife, the new house represented new life and a new way of looking at the world. 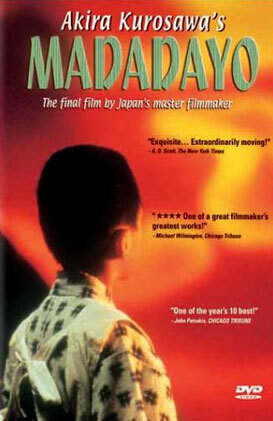 Uehida’s subsequent essays were much loved and one in particular provides what little drama there is in Kurosawa’s last film Madadayo. ‘Nora, My Lost Cat’ is an account of the inconsolable loss that he experienced when a stray cat that had attached itself to him mysteriously vanished. His students helped search for the feline, understanding that their former Professor had a sensitivity and imagination beyond them all but it never returned. Tatsuo Matsumura was 79 when he starred as the dapper 60 year old Professor who ages gracefully over the next 17 years, each one marked by a reception held by the students in his honour. Every year they act out a childhood game not dissimilar to hide and seek; the students ask “Are you ready?” and the Professor replies “Not yet!” (“Madadayo!”), a reference to his tenacity and inevitable encroaching demise. Kurosawa was 83 when he directed this sweet and thoughtful film and was obviously thinking about his own death when he painted a psychodelic sky backdrop for his character’s child-like alter ego to waft off into, accompanied by Vivaldi. Hopefully when he did pass away five years later it was as beautiful as this.